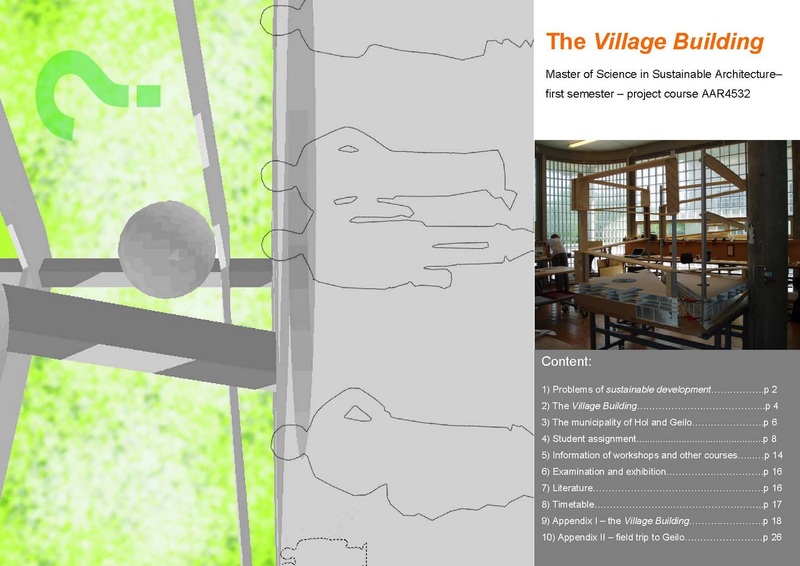 The students will in this course design neighborhoods/blocks within the Village Building in accordance with local climate, related to the site at Geilo and the Village Building in itself. Each neighbourhood/block consists of several sites with different character. The relationships between the neighbourhoods /blocks and the sites in the structure are unusual because they are located above one another, at the same time as they must relate to the whole of the structure. The ramp that runs as a spiral through the Village Building (the public road) constructively divides the neighbourhoods. The gross width of the ramp is 15 meters, the gross height 1,5 meters, and is intended to contain infrastructure of water, waste water, drainage, waste (vacuum waste systems should be considered), cables etc. Good architectural qualities of the neighbourhood or block in itself as part of the whole of the Village Building are important to succeed. Investigating sustainable development in relation to the built environment; different scales and approaches must be considered. Technical innovations and improvements can be applied to existing built fabric and incorporated in new developments as they are planned today. But, due to global population growth, networks of transportation and the need to preserve natural resources, it is a question if new typologies and settlement patterns are required. Issues of land use, food production, transportation and communities are in this respect essential, together with systems of energy, water and waste. This course will focus on a particular development strategy, the Village Building, which was an entry for an open ideas competition in 2006/07. The competition was called “Modern living solutions in the countryside” [Moderne boløsninger på bygda], and the entry for the Village Building was a critic to scattered settlement patterns of the countryside in Norway, as resource demanding at different levels. Economically the Norwegian countryside is subsidised by the state; socially it lacks public and civic arenas, attractive job opportunities, and often has small public service units; ecologically it occupies too much land for infrastructure and buildings, it is energy demanding and dependent on individual transportation. The answer to this statement could be that everyone should live in cities; however, suburbs around cities and urban sprawl have similar problems. Through a reconfiguration of public infrastructure into a compact development strategy for about 5000 people, the Village Building is an alternative that could provide for a more sustainable life in the districts, offering both urban and rural qualities.